By the 1950s, many Americans had more disposable income, and they shared their prosperity with their pets in a variety of ways. The pet food industry, which I’ll discuss in future posts, was one beneficiary of shoppers’ increasing ability to spend and their general interest in consumer goods that were supposed to make daily life easier. Pet shops and the pet departments of department, drug and five-and-ten stores started to stock other items that were marketed with the promise of making pet ownership more convenient. Americans h ave a long history of interest in labor-saving devices; a keyword search of Google Patent simple for the term labor-saving results in over 330,000 hits. I wonder, however, just how much labor could possibly have been saved by the V.I.P. Electric Pet Brush. When I purchased this item, I noticed the cord and plug were in good shape, and I thought that I’d try it out on one of my victims…er, pets. I chose one of the biggest shedders in my house, a long-haired tuxedo cat named Ed (who I will also introduce you to in another post). I waited until Ed was relaxing in the sun, which gave me the element of surprise. When I turned on the V.I.P. Eletric Pet Brush, it started to buzz like a bumblebee and, well, vibrate — but more like one of those coin-operated motel beds than a personal grooming product. Ed shot straight up in the air and took off with his legs churning like a cartoon character. This, and the fact that the plug and cord tie the user to a pretty small space like a tabletop, may be why the brush is in such good shape, and also why it seems to be rare — it was a flop. 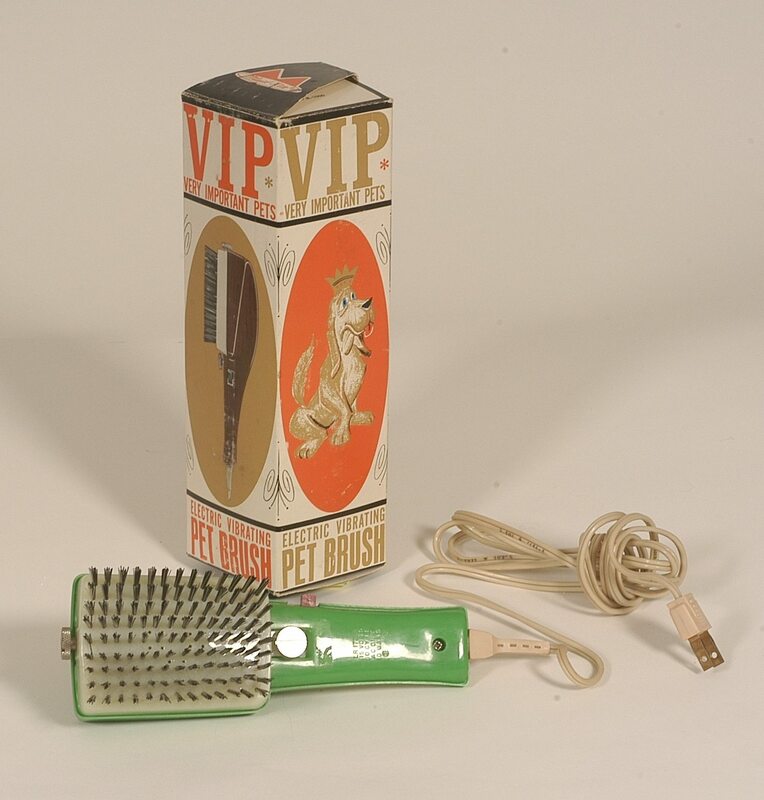 Even so, this personal grooming appliance for pets tells us something about how the drive for novelty in the marketplace of the 1950s and 1960s touched the pet business.